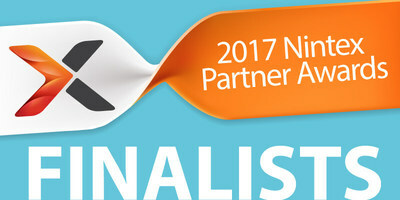 BELLEVUE, Wash., June 28, 2017 /PRNewswire/ -- Nintex, the recognized global leader in workflow and content automation (WCA), announced today the finalists for the 6th annual Nintex Partner Awards. These awards recognize the valuable contributions channel partners have made in helping organizations of all sizes, in every industry, improve the automation of business processes with Nintex technology. "Nintex partners are instrumental to driving the rapid adoption of the Nintex Workflow platform across enterprise organizations," said Nintex CEO John Burton. "We look forward to recognizing top Nintex partners for their workflow and content automation success during our Partner Appreciation Party on July 10th in Washington, D.C."
Solution Innovation award categories (document generation, mobile and apps, process automation and process intelligence) are judged based on nominations submitted by partners. Performance Driven award categories (business acceleration, business excellence, customer success and regional spotlight) are judged based on partnership metrics such as customer adoption, growth, revenue, etc. The winners of the 2017 Nintex Partner Awards will be announced on Thursday, July 6. Nintex will also celebrate the wining partners at the Nintex Partner Appreciation Party, https://www.nintex.com/company/events-webinars/events/inspire, on Monday, July 10 from 7 p.m. to 10 p.m. at the Old Ebbitt Grill in Washington, D.C.
Nintex is the recognized global leader in workflow and content automation (WCA) with more than 7,000 enterprise clients and 1,700 partners in 90 countries who have built and published millions of workflow applications. With its unmatched breadth of capability and platform support delivered by unique architectural capabilities, Nintex empowers the line of business and IT departments to quickly automate hundreds of manual processes to progress on the journey to digital transformation. Nintex Workflow Cloud™, the company's cloud platform, connects with all content repositories, systems of record, and people to consistently fuel successful business outcomes. Visit www.nintex.com to learn more.